Today marks our one year anniversary with Kelli and Dan's gorgeous wedding at Malibu Rocky Oaks. Take a look at some of our favorite shots from this collaboration with Alex and her team at Sterling Engagements! 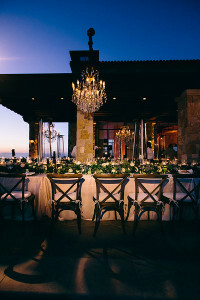 Venues simply don't get much more breathtaking than Malibu Rocky Oaks vineyard. 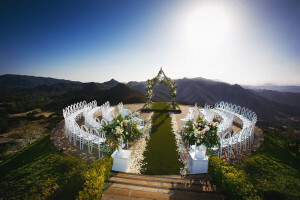 Kelli and Dan said their vows on the estate's helipad with beautiful views of the Malibu mountains. The ceremony featured a semi circular chair design using sleek white infinity chairs. The couple married underneath our custom-built canopy structure adorned with slightly asymmetrical florals and chiffon. The look featured a stage and aisle covered in grass to tie the look together.The canopy also featured one of our large chandeliers- it really brought the glitz and glam to this romantic outdoor look! The sunset over the Malibu hills illuminated our whimsical florals to create the perfect backdrop for their vows. 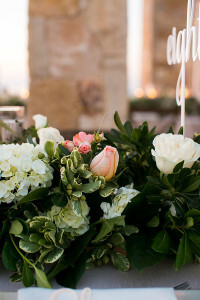 Bouquets featured large garden roses, spray roses, stems of white hydrangea, and tons of greenery. 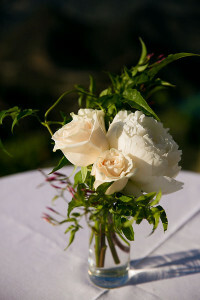 These ingredients came together to create the beautiful bouquets you see here. Kelli's large and unique bouquet featured the same ingredients but beautifully cascaded down to the floor. We didn't miss any details for this event- just take a look at our custom made dog collar for the ceremony! The table set up consisted of two long designs running the length of the patio in the back of the estate. Using the same florals that were used for the bouquets, we created long garlands which had hundreds of floating candles nestled within to run down the lengths of the tables. The tuscany chairs looked wonderful with this look! Last, but definitely not least, we have our super fun and custom designed lemonade stand! We had so much fun building, staining, and sanding the wood to create this aged look. These large yellow peonies were absolutely gorgeous and brought a very garden-y feel to the cocktail hour! Watch our designs in action in the beautiful cinematography from Custom l Made Productions below!